I know that overclocking only appeals to a small percentage of users out there but it's just so much fun. The Epod 4PDA2+ introduces some of the most impressive voltage options we've seen on a P4 motherboard for enthusiasts to play with. Here is how our overclocking adventure unfolded with the Epox 4PDA2+ and an Intel Pentium 4 3.0C. Starting at 200 MHz we slowly began to raise the FSB and at around 210 MHz we ran into a few stability problems, but raising the voltage to 1.6V solved those problems. 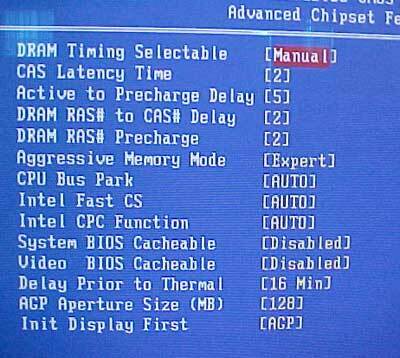 We continued ahead and at 220 MHz FSB the Corsair XMS3500 memory started to give out. Raising the voltage to 2.8V fixed that for us and we began to go higher yet again. At 230 MHz FSB the memory gave out again and no matter how much voltage we fed it, it wouldn't work so we had to enable the 5:4 memory divider to keep things stable. Amazingly, we ended up with a final FSB of 235 MHz which is very good considering we're using a 3.0C. So, you like to tweak? Epox gives you all the memory options you'd like to play with. From CAS Latency to RAS Precharge, and even tools like CPU Bus Park and Intel CPC. 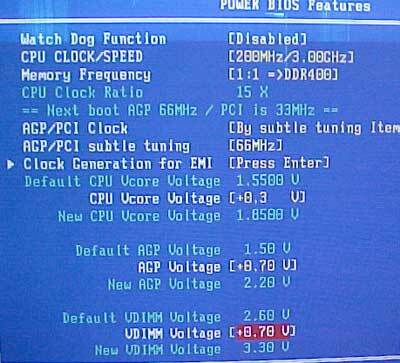 In the Power BIOS Features is where the 4PDA2+ shines. The board can go from 100-350 MHz FSB in 1 MHz increments. Perhaps with future BIOS updates this will rise even higher as the ICS 952607EF clock generator supports FSB's up to 400 MHz. There are the usual 1:1, 5:4 and 3:2 memory dividers and you can manually adjust the AGP/PCI frequency. The Epox 4PDA2+ allows up to a 1.85V CPU voltage, 2.2V AGP voltage and 3.3V memory voltage.